Pelosi Just DISSED Occasional-Cortex AGAIN - Here's Her Latest Barb! Pelosi Just DISSED Occasional-Cortex AGAIN – Here’s Her Latest Barb! Trouble in Paradise, Nancy? When a 60 Minute interview started asking uncomfortable questions, Pelosi threw AOC & Co. under the bus. It makes you wonder who is really running her party. When Lesley Stahl asked some probing questions about whether there is any problem keeping the widening gulf between Democrat factions in line, her answer seemed a little… forced. Almost like she was trying to convince herself, eh? Does Pelosi even know what her party believes? Or is she desperately trying to keep them from swinging so far to the left that the party ‘McGoverns’ itself in 2020 the way it did in 1984? Did Nancy not get the memo? Last we checked, Socialism is a big part of the platform the 2020 hopefuls are building their run on. How can it NOT be part of the ‘Democratic Party’s view’? Is it possible the party has swung so far left it’s leaving Pelosi behind? Hardly surprising — revolutions have a long history of devouring their leaders. A new player has now taken the field, one that came ‘out of nowhere’. She cut her teeth working for Bernie 2016, and has picked up a trick or two about ‘community activism’. Alexandria Occasio-Cortez (‘AOC)’ has a take-no-prisoners arrogance, a deep loathing for the history and institutions of America, the unflinching zealotry of a convert to a cause, and a rigid ignorance impervious to all logic. Add to that mix her youth, her social media savvy, and the unswerving obedience of the Media(D)’s Partisan Press, and you have a wannabe American revolutionary with lofty goals every bit as transformative as Lenin, Castro, Che Guevera or Mao. And naturally, she’ll conveniently forget any of her objections to ‘dark money’ so long as it applies to any of her wealthy benefactors. 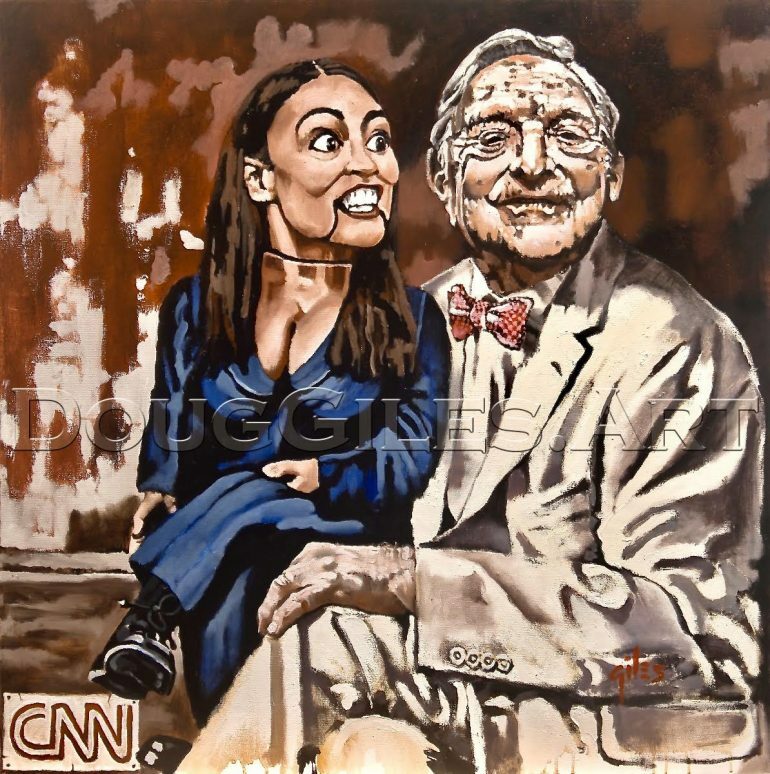 She’s the perfect delivery system for the Soros agenda… as depicted by Doug Giles’ latest piece in his MAGA series, Soros & His Dummy. Visit his gallery to see his entire badass collection of nature art, historical figures and yes, of course, the other pieces in his MAGA series.